On Friday, Bonnie gave us another clue. I was excited to get this clue because I planned to meet with other quilters from my guild to sew all day. Catie reserved a room at a local library and set up everything we needed. All we had to bring was our machine and project. The clue was to make half square triangles. I am not following the colors that Bonnie used, instead of blue I substituted orange. I found some orange fabric left over from the baby quilt I made for Sami when she was born. It was exactly the shade of orange that I needed for “Good Fortune!”. My daughter is not sewing the mystery quilt but she joined us to work on some Christmas gifts she is sewing. Everyone was welcome to sew on any project of their choice. I worked on my mystery clues as did several of the ladies. I had a very enjoyable day and finished sewing all the HSTs (half square triangles) for clue 2. The day reminded me of all the good times I had sewing with my friends back in Hicksville. Here are my HSTs, counted and clipped together. It is not too late to join the mystery. You can find the previous information and clues here ... Good Fortune! -A Quiltville Mystery. Today is link-up day at Bonnie’s blog. 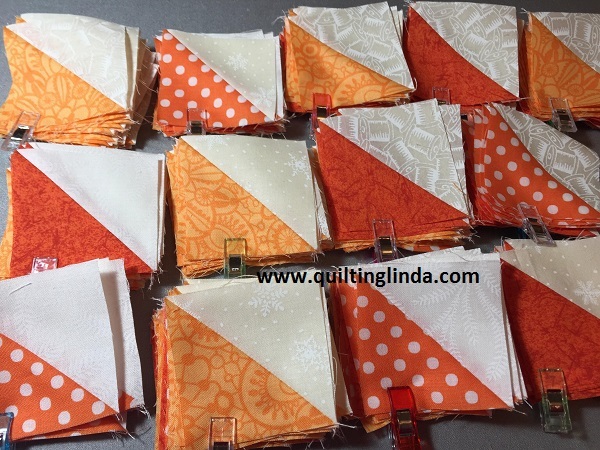 Other mystery quilters will be sharing their versions of clue 2 at Monday Mystery Link Up.